This is so obvious, such a no-brainer, such a necessity for good governance that it should have as close to 100% support as anything that could be introduced in Congress. Forget the Vitter amendment. 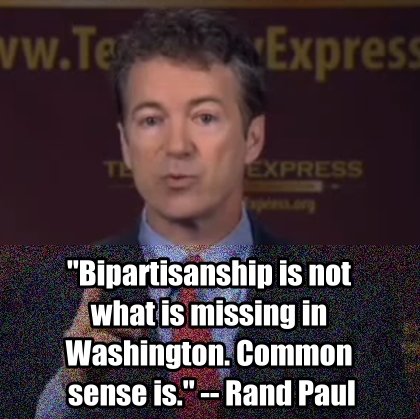 Rand Paul wants to make sure that Congress can’t ever again write laws with provisions specific to lawmakers. The Kentucky freshman Republican has introduced a constitutional amendment that would preclude senators and congressmen from passing laws that don’t apply equally to U.S. citizens and Congress, the executive branch and the Supreme Court. The amendment is aimed squarely at Obamacare provisions specific to members of Congress and their staffs that became a central point of contention during the government shutdown. Under Obamacare, Capitol Hill aides and lawmakers are required to enter the law’s health exchanges and a summertime ruling from the Office of Personnel Management ensured they will continue to receive federal employer contributions to help pay for insurance on the exchanges. A number of lawmakers, specifically Sen. David Vitter (R-La. ), have been pushing for the end to those contributions, arguing they amount to a Washington exemption from Obamacare. Vitter has drafted legislative language that would eliminate these subsidies and tried to attach the measure to an energy efficiency bill and pushed for it to be included in the government funding bill last week. Paul seeks to go a step further and amend the Constitution so that “Congress shall make no law applicable to a citizen of the United States that is not equally applicable to Congress,” the executive branch including the president and vice president as well as the Supreme Court. Paul told the Daily Caller in September that the amendment would take specific aim at Supreme Court Chief Justice John Roberts, whose swing vote upheld the constitutionality of much of the Affordable Care Act. “If he likes Obamacare so much, I’m going to give him an amendment that gives Obamacare to Justice Roberts,” Paul told the publication. We live in a country where there’s one set of rules for politicians in D.C., their staffers, and their cronies and another set of rules for the rest of us. That’s the same sort of corruption we see in Third World banana republics and it’s time for it to end. Obama should be on Obamacare. The Supreme Court should be on Obamacare. Congress should be on Obamacare. All of their staffs should be on Obamacare. Every government employee that has anything to do with implementing Obamacare should be on Obamacare. Make all of these people live by the same laws that they force on the rest of us and you’ll be surprised at how quickly we get some real “change” in D.C.